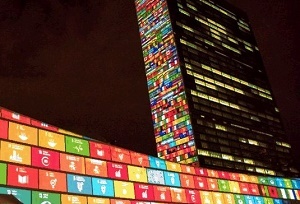 Are we on track to meet the Sustainable Development Goals (SDGs)? When governments and key stakeholders gather next week for the High-level Political Forum on Sustainable Development (9-18 July), they will have their hands full as they take stock on where we stand and how to advance with the ambitious 2030 Agenda. Bringing a regional perspective to the discussion tables in New York, UNECE will be actively engaged in the exchanges. Executive Secretary Olga Algayerova will lead a UNECE delegation and present priorities from the region at a series of sessions and side events. In a joint session of the five UN Regional Commissions, the Executive Secretaries will present a diversity of regional perspectives on SDG implementation, share examples of best practices and experiences, and provide policy recommendations for action at national, regional and global levels. The session will look at regional trends and support inter-regional peer learning at the HLPF. During the session, Executive Secretaries will engage in an interactive discussion with Member States, representatives of regional and sub-regional governmental organizations, major groups and other stakeholders. Regional perspectives on the global sustainability agenda will also be in the focus when the Chairs of the Regional Forums report on the outcomes of their respective meetings. In the run-up to the High-level Political Forum, each of the five regions convened a multi-stakeholder forum to share experience and find concrete solutions on how to achieve the SDGs. UNECE’s Regional Forum, with a focus on practical peer learning, brought an unprecedented number of over 600 registered participants and almost all member states together in Geneva in early March 2018. At the High-level Political Forum, Switzerland’s Envoy on Sustainable Development, Ambassador Michael Gerber, will present the outcomes of the UNECE Regional Forum, jointly with the Chairs of the other Regional Forums. Alongside the formal agenda, UNECE co-organizes eight side events covering a large variety of themes. In a joint side event of the G77 partners and the Regional Commissions the discussion will focus on how to promote technological progress while supporting inclusive economic growth and generating employment opportunities, especially for youth. Further side events co-organized by UNECE focus on the topics of “Transboundary Water Cooperation” (SDG 6), “Smart Cities” (SDG 11) as well as on “Forests and Sustainable Fashion” (SDG 12 and 15). These side events reflect the relevance of the work of UNECE for the achievement of the 2030 Agenda and specifically for the SDGs that are reviewed in depth this year. Over the course of the High-level Segment (16-18 July), a record number of 47 countries will present their Voluntary National Reviews (VNRs). VNRs were called for by the 2030 Agenda to facilitate the sharing of national experiences, including progress, challenges and lessons learned, in order to accelerate the implementation of the SDGs. 15 of these countries are from the UNECE region. Since 2016, about half of UNECE member States have undertaken Voluntary National Reviews, exemplifying the strong commitment of governments in the region to the SDGs. 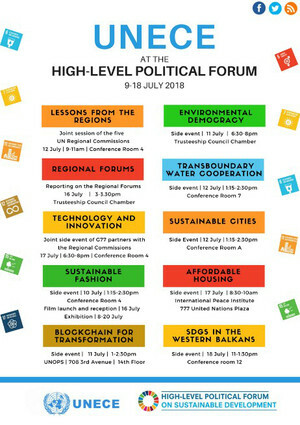 Taking place from 9-18 July 2018, the High-level Political Forum is the central annual platform of the United Nations for reviewing successes, challenges and lessons learned on achieving the Sustainable Development Goals (SDGs). More than 2000 stakeholders of the global sustainability community will discuss how to accelerate progress under this year’s theme “Transformation towards sustainable and resilient societies”, while focussing on the SDGs that are reviewed in depth this year: SDG 6 (clean water and sanitation), SDG 7 (Affordable and Clean Energy), SDG 11 (Sustainable Cities and Communities), SDG 12 (Responsible Production and Consumption, SDG 15 (Life on Land), SDG 17 (Partnerships). The global forum is convened under the auspices of the Economic and Social Council and takes place at the United Nations Headquarters in New York. In a joint session of the five Regional Commissions, the Executive Secretaries present key challenges and trends of their respective region. The Chairs of the Regional Forums on Sustainable Development report on the outcome of their respective regional forums. The contribution of transboundary water cooperation to achieving the sustainable development goals – how far have we come, and what still needs to be done?